This new dub album from Yabass Yaba Radics follows up the recent well-received ‘Community Rocker’ (see reggaemusic.org.uk 12th January 2013) with nine further tracks in a retro dubplate style. Grouped around a spoof Western theme, Dubplate Drifter opens with ‘Arrival’ – a repeating two chord instrumental with its drums and bass rhythm becoming a little more assertive toward the end – before the more muscular ‘Everyday Hustling’ bursts in with some classic dub styling held together by a powerful bass, with a hint of Tubby-era hi-hat in there somewhere too. A very decent dub. ‘Saloon Wondering’ (nice word play on ‘Everyday Wondering’ to be found in these two track titles..?) follows through with another steady dub in the old style, while the final track on ‘Reel One’ offers a melodica-sound that conjures up the intended spaghetti Western theme, reflected in its title ‘Big Chief Van Cleef’. Most of the tracks on ‘Reel Two’ are perhaps too similarly slow in tempo, demanding of a bit more light and shade, though ‘Heavy Horse’ is worthy of attention, its bass phrase and drum mixed up-front, with everything else much further back in the rhythm. ‘The Rapids’ is, in contrast, a more uptempo rhythm track with a fine dubbed-up sound, instrumentation fading in and out in the familiar dub style. As an instrumental album in the continuous dubplate style of releases of the past, the music fits the feel of the dub tradition and generates an atmospheric sound consistent with its theme. Produced by Gibsy Rhodes, and mastered at Maximal Sound in France, the imperfections of the sound are more than made up for by the period feel of the music and the sympathetic production throughout. 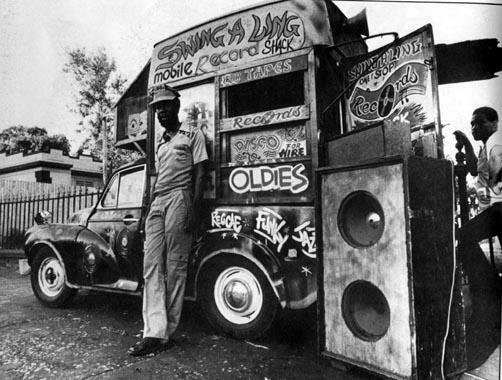 Yabass Yaba Radics: Dubplate Drifter. Release 20th April 2013 on CD, DDL and tape (Smash N Grab/Springline Jamaica label). Comparing the UK with Iceland leaves two distinct impressions. First, allowing a bunch of greedy and incompetent banks to fail and the national currency to devalue to its own level thereafter (the Icelandic model) is probably better than using vast sums of borrowed money to prevent a similar bunch of greedy and incompetent banks from failing and having to suffer the consequences for generations to come (the UK model). Second, compared with Reykjavik, the north east of England is not cold at all. Indeed the tropical and balmy coastal climate of north-eastern England rivals that of the Mediterranean in almost every way. These two facts established, let’s turn to Icelandic reggae, one aspect of a vital local musical scene. With this debut album release, Ojba Rasta – formed in 2009 – give us a strong collection of eight tracks whose influences from the received reggae tradition are clear but which manage to sound both original and fresh. There isn’t a readily equivalent UK reggae band and it’s all the better for that. The album kicks off strongly with Gjafir Jardar (roughly, Gifts of the Earth) with its brass-led upbeat instrumentation, a styling and vocal delivery reminiscent of 80s dancehall, with the Eek a Mouse inspiration credited up front. Then it’s into Hreppstjorinn with a melodic and relatively mellow feel that characterises this and other tracks, and a similarly characteristic guitar solo thrown in for good measure. Solstudor (Solstice) is a fascinating and lengthy instrumental track, sounding a lot like a theme for a weird Western movie set in the Icelandic interior, with a more than usually syncopated reggae rhythm galloping along throughout with some intriguing chord changes to make life interesting. Jonsmessa is a further strong instrumental track with a fine dubbed-up mix keeping things moving along. Jolly Good is the only track titled and sung in English, opening with the memorable line ‘I’m a little wanker’, its tone suggesting sentiments more akin to ‘I’m a creep’ than to, say, ‘I’m a believer’, ‘I’m a man’ or indeed ‘I’m a little teapot’. The closing track I Ljosaskiptum is a very strong way to finish, the initial vocal style from guest MC more akin to hiphop than reggae before moving into an extended and impressive dub outro. Production throughout is clear and strangely – pleasantly – gentle, lacking any of the harshness associated with latter-day offshoots of digital reggae. Released autumn 2012 on Record Records, it is currently available in the UK in download format.